You can easily drive from Phuket to Ko Lanta. On the way enjoy the stunning view of limestone mountain and the trapicle rainforest of south Thailand. Take 4 hours to Ko Lanta without stop but you can visited many place passing by, take you time, drive slowly and enjoy seightseeing. 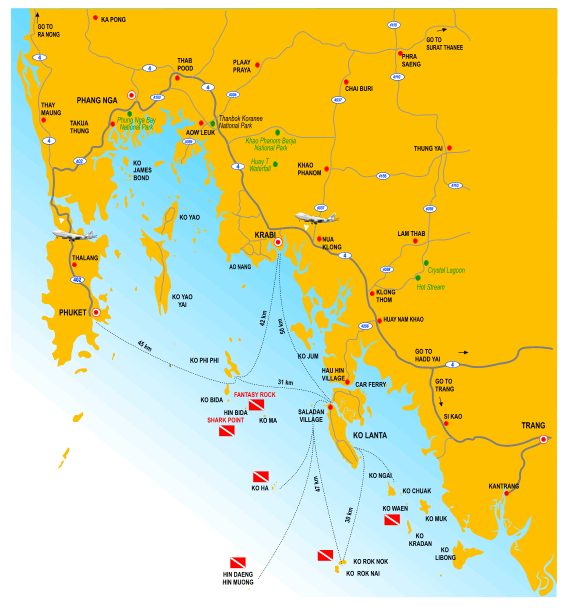 From Phuket, grab the highway to Phang-Nga (HW no.402) around 80 km. to hit the T-junction, just turn right (Turn left to Phang-Nga city) the signed board shown to Krabi and Trang. Keep driving for another 22 km. until to Thap-Pood district and turn right again on the road no. 4 (Phetkasem rd.) Go forward hit 23 km. will get through the Ao Leuk district and hit the big junction. If you have enough time, just turn right for another 10 km. to visit Thanbok Koranee National Park. From Ao Leuk Junction, keep going straight to Krabi Town with only 40 km. left. 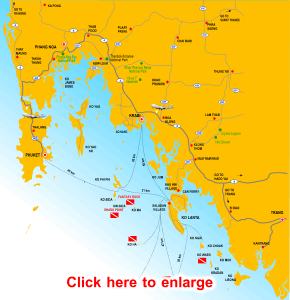 Follow the road for another 30 km, the right hand side is Ao Nang area which you can visit Ao Nang Beach, Nopharat Thara Beach and shell fossil cemetary. If not, keep forword to Krabi. Hit the T-junction with traffic light, the signed board shown turn left to Trang and Had Yai keep this way. Drive over Krabi Town (pass another big T-junction) around 10 km., on the left is the way to Noppharat Thara National park (Huay To Fall) with Tham Sua Temple, good place to visit if you have plenty time. Keep going straigth will pass Krabi Airport on the left and another 10 km to Nua Klong District and 43 km. to Klong Thom District. Pass by Klong Thom for only 8 km., becareful you need to turn right to small street to Koh Lanta. See the signboard will show go to Ko Lanta National Park and Ko Rok. After turn right, keep stright for anoth 28 km. you will hit the first car ferry. Driving from Phuket to Ko Lanta just get more fun. The stunning of limestone mountain and tropicle rainforest beside two side of the road have very good view. On the way will pass by many national parks and tourist places which you can visit. The first ferry will accross to Lanta Noi, it will spent half or one hour up to the traffic. After first ferry, keep following the way around another 4 km. will see the signed board to CAR FERRY TURN LEFT. Turn left here is the unpaved and dirt road, drive carefully for 3 km. will hit the second ferry. This ferry will take shorter time and more nearer. After this one, Here we are Ko Lanta. The ferry cost is 50 B. for car and 10 B. for each passenger. The ferry start at 7:00 am and finished at 10:00 pm everyday.